On the eve of the Greenhouse Food Festival, a wet and grey Friday morning, Mamonosi Mahlophe and her colleague and friend Mamosweu Tsoabi, are picking weeds from their garden. They are preparing for the festival that will provide emerging farmers with the platform to showcase their innovations and produce to private funders, and potentially sell their products. As the rain worsens, they hurry into the run down, yet architecturally-appealing glasshouse to join another colleague, Dineo Tsoabi. This building houses more of their produce and is expected to be a big attraction for the festival. With the thundering sounds as a backdrop, the ladies go about their business while discussing the work that still needs to be done. It has been a busy week for them. Amid the rain and preparations for the festival, the ladies held a workshop teaching women how to make what they call the “Wonder Bag”. On the corner of Klein and Wolmarans streets in downtown Johannesburg, is a place that is home to a shining beacon of the symbiotic relationship that can exist between society and nature. It is a place where lush green vegetables and herbs abound, bees and other small creatures swarm the space, producing honey and pollinating plants; it is a place of hope not only for the people who work there, but also for the surrounding community that relies on its produce. It is a place where the medicinal properties of the stinging nettle are as valuable as the delicious taste and fresh aroma of the mint being harvested. A place where waste material is not just waste, but a vital resource to create gas, compost and to generate an income. 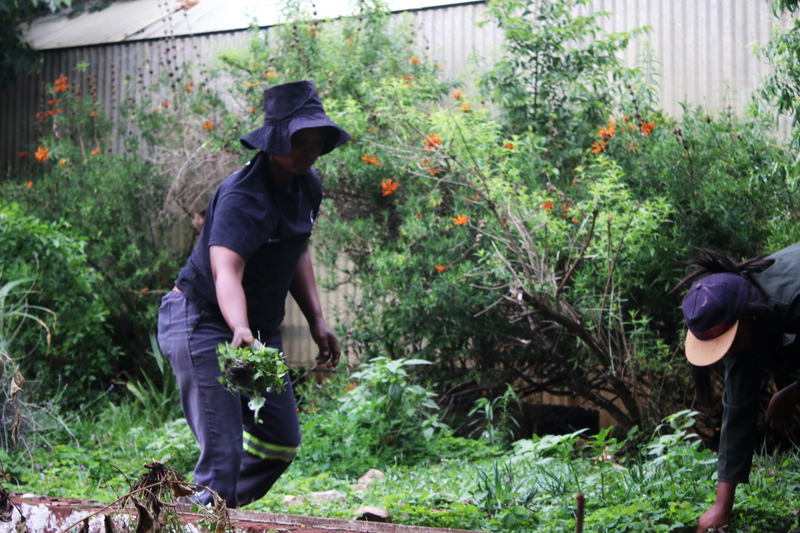 GREEN LIVING: Mamonosi Mahlophe and Mamosweu Tsoabi clean up the garden in preparation for a food festival at the Greenhouse People’s Environmental Centre. The Greenhouse People’s Environmental Centre has been a place of great pride and hope for people like 24-year-old Mamonosi who, together with three close friends, has formed a company called Serapeng Co-operative. The women of Serapeng have partnered with Greenhouse and Gender CC, a network of women for climate justice, to establish a number of sustainable and renewable projects that generate food, energy and income. The ladies of Serapeng manage many different projects at Greenhouse. Their primary work is the harvesting of vegetables and herbs. The food which they produce is used to sustain life at the centre. The rest is sold to generate an income as the ladies are renting the space from Greenhouse. In addition, they grow medicinal plants such as rhubarb, whose roots have healing properties for people suffering from muscle aches and pains and comfrey, which is used for cuts and bruises. But the most fascinating of their harvest, is the stinging nettle. The subtle sting may be a bit of a shock when first touched. But this is the beauty of the plant, it’s value lies within this sting. The Serapeng ladies say is can cure many ailments including high blood pressure issues. The plant may also be drunk as a tea, which is good for cleansing the blood stream and immune system. They also produce ointments, cough mixtures, syrups for women, hair and skin-care products which they sell to surrounding communities. “We also make candles from beeswax which also helps with air pollution because once lit, the flame can change carbon dioxide and release oxygen,” says Mamosweu. In addition to their garden, the ladies from Serapeng manage a biogas digester plant which produces the gas they need for cooking and for making their products. “We use cow dung to create the methane gas. Once the gas has formed we use weeds and organic waste to feed into the digester to produce gas,” explains Mamosweu. GLASS HOME: The beautiful glasshouse which the centre is planning to revamp and extend its use to an entertainment area. On the day of the Food Festival, the weather has cleared up. It is a beautiful and sunny day with a slight breeze. Today, the ladies work on a Saturday which is unusual for them but a good cause nonetheless. The festival not only gives other farmers a platform to showcase their work. But also allows people to come in and behold the beauty of this place. Tent upon tent is filled with food activists, climate activists and tables of honey, mustard-coloured soap made by bee farmers and even organic tools such as knives. Serapeng’s commitment to a sustainable way of life and producing of energy speaks to their passion about being conscious of their impact on nature. The ladies refer to themselves as climate change activists at heart. “We are also engaged in climate change and energy awareness programmes. We go into communities and give talks and screen films that raise awareness about climate change and what causes it. We then introduce renewable energy as a way of solving the climate crisis and rejuvenating the city in a sustainable way. One of the ways in which this can be done is by using our Wonder Bags, which we design. We also design solar cookers which are mostly used by people in rural areas and informal settlements. We use galvanised sheets which can absorb the sunrays,” Mamosweu boasts with visible pride in their work. The Wonder Bag she speaks of is a simple bag made of cloth which is sown together and stuffed with little pieces of sponges. When complete, the bag saves energy in that one need only, for example, boil one’s rice on the stove until boiling point and then take it off the stove, put it in the bag and let it cook by itself for as long as eight hours. This limits the time that one uses energy. “A lot of people believe that work is when you go work for someone else. We want to ensure that people know that they have the ability to create work for themselves. There are a lot of women who are employed and when you look at it, once you equip them with skills, they can do things for themselves,” says Mamosweu. Mamosweu and her sister, Dineo, grew up in Vanderbijlpark, south of Johannesburg, but now live in Vereeniging. Their passion for their work stems from their childhood. They were raised by two parents who loved nature and farming. “They taught me that farming is what sustains life and how important it is to have your own food garden, to be able to sustain yourself and have your own project rather than always looking for work,” says Dineo. Like the Tsoabi sisters, Mamonosi also grew up in the Vaal area. She was raised by her grandmother who enjoyed harvesting vegetables and had her own garden. They would plant food in the garden and whenever they wanted to eat they would just get food from the garden and cook it. “Agriculture is in the blood because I was raised on it,” she says. It was these formative years that set her on a path of eco-friendly living. A few years ago, Mamonosi met the Tsoabi sisters and another lady who shared her passion for organic farming. They were attending workshops about farming and climate change. As it turned out, Dineo and Mamosweu had a piece of land in the Vaal which belonged to their family. They decided to seize the opportunity by turning it into a farm and growing their own produce. They still grow vegetables on this farm, which is managed full time by the fourth member of Serapeng. Eventually they were introduced to Greenhouse and two years ago, together with Gender CC, they formed Serapeng Co-operative. Today, the ladies of Serapeng have expanded their business beyond farming. They produce medicinal products, farm bees, advocate for eco friendliness, generate their own energy and they are now teaching the surrounding community about sustainability and renewability. The Greenhouse People’s Environmental Centre has become a sanctuary, not only for the surrounding community, but also for local informal traders and small businesses. It is a breath of fresh air in a place where tall, dull and grey buildings line the city sky. It has become a “walk-in demonstration centre [where] people can walk in and they want to know what happens to the centre. We have international tourists who are curious about it,” says Greenhouse centre manager, Thabisile Mchunu. Besides Serapeng, the centre is home to Conlinea Health and Wellness Centre, which is an ethno-medical facility. Another project located at Greenhouse is Trashback which was set up to manage Greehhouse’s recycling plant and deal with waste that is brought in by waste re-claimers. “We have another team called Vuk’uzakhe,” says Thabisile, “which is a group of three young men who come from the Eastern Cape. They are volunteers who are here every day. Before that, they were a part of the Johannesburg Eco-Guides which was a project financed by the City of Johannesburg. 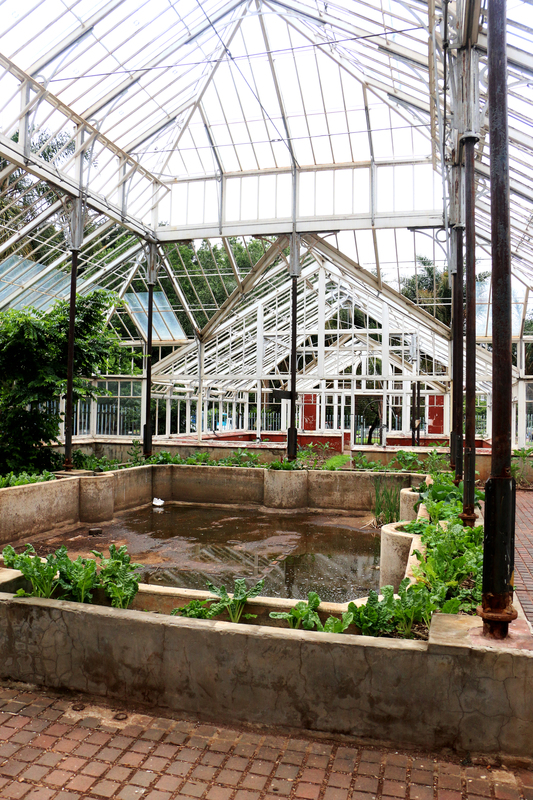 There is also a hothouse which is utilised by Urban Farms who produce compost from earthworms. Their latest project is producing portable geysers. The centre is working with a young man who is distributing small, portable geysers and has already begun attracting major financial donors. The geysers can be attached to taps and then dispense hot water. The centre allows peoples to come in as volunteers and acquire skills in sustainable and renewable living. A number of successful projects have sprung up as a result of the work being done by Greenhouse including several food gardens on roof tops in the CBD. In addition, Greenhouse encourages entrepreneurship as a means of sustainably solving social issues. The centre is what they call a “plug-in” centre where aspiring business owners can use the Wi-Fi and also get business advice from the centre management. Greenhouse is somewhat of a utopia of sustainable and renewable living. It reminds us of the good which can come from being conscious of our impact on nature. Unfortunately, like the rain falling down during a season of drought in South Africa, Greenhouse is a rare place to find. In fact, there is no other place like it in the inner city. The problem, according to Earthlife Africa’s education officer, Thabo Sibeko, is threefold. On the one hand, we have to begin to change our mindsets when it comes to sustainable living. “We need to develop people’s mind-set. There is a misconception that having a food garden is for the poor of the poorest, which isn’t true,” he says. Secondly, sustainable energy technologies have to be modernised to meet the needs of a busy workforce in the city. Most people just don’t have time to use cookers that take three times as long to prepare a meal, eco-friendly or not. The biggest problem, however, according to Sibeko, is over-population. “We have a serious problem in the city with regards to population. We are running out of space, even to walk. Sustainability can add value by firstly dealing with issues of policies about living in the city,” says Sibeko. Unless we can find more sustainable and renewable sources of energy, we run the risk of depleting our natural resources. In densely populated parts of the city such as the CBD, the need for energy is crucial and for many, expensive. Sibeko is an advocate for sustainable and renewable living in Africa. He spends his working days teaching, lobbying for and building sustainable and renewable methods of generating energy, income and food security. He is currently working on a project called Sustainable Energy and Livelihoods Project which is a collaborative effort between Earthlife Africa and the Department of Agriculture and Rural Development to install biogas digesters in schools around the city. Earthlife Africa is the lessee of the property on which Greenhouse operates. The property belongs to the City of Johannesburg (CoJ), which has leased it to Earthlife. The heavy rains that have fallen during this week may have been tragic for some, but here the rain is highly appreciated. Every drop is celebrated. Finally, the produce can be rejuvenated. Much the same way as the ladies of Serapeng rejuvenate their community.